The mystery of death: Why is it a secret? About halfway to Chennai from Nagapattinam, one of the vehicles in Amma’s caravan began showing signs of engine trouble. It was also past time for lunch. So when the caravan passed by a large auto-parts factory and engine-repair facility, Amma instructed everyone to pull over and inquire if the group could have its lunch there. To everyone’s surprise, the factory was owned by one of Amma’s devotees who had actually come for Amma’s darshan the night before in Nagapattinam. During his darshan he had asked Amma to come visit his home on her way to Chennai. However, Amma had told him that such a visit was impossible, as there was no time. You can imagine the surprise of the devotee when his employees called him and told him that Amma had suddenly appeared at his place of business! He immediately gathered his wife and two daughters, and 10 minutes later they were all sitting at Amma’s feet with the rest of Amma’s disciples and devotees. After giving everyone prasad in the form of curd rice and curry, one of Amma’s brahmacharinis began to tell a story. It was the lead-in tale of Kathopanishad, the Vedic teaching delivered by Yama Dharmaraja, the Lord of Death, to a young Brahmin boy. Almost verse by verse, the brahmacharini related the story of how Nachiketas came to leave the earthly plane and visit Lord Death in his abode. She explained how, in fact, when the boy reached there, Death was not home and how Nachiketas had to wait three days for him to return. For each day he was forced to wait, Death granted Nachiketas a boon. Finally, impressed by the Nachiketas dispassion, Death began imparting his precious secret. But at this point, the brahmacharini stopped the story, saying that she could not proceed further as, like Lord Death had said, the knowledge was a secret. This is where Amma came in. Amma said that the Vedantic teachings regarding the ultimate reality are not given out to just anyone. Only upon being convinced of the mental maturity of the student will the Guru begin to undertake such a teaching. If Vedanta is taught to one who is not mature enough, it will be wasted or could even result in harm. In order to illustrate this point, Amma told two stories. Amma then told everyone that the scriptures say there are three types of disciples: the uttama adhikari, the madhya adhikari and the adhama adhikari the top, the middle and the lowest. Amma’s second story went like this: Once upon a time, there was a great Vedantic scholar whose prized possession was a parrot that he’d taught to chant all of the Vedas. One day while walking through the forest, this scholar was attacked by a ferocious lion. At the last possible second before the lion fell upon the scholar, a forest-dwelling hunter suddenly appeared and shot the lion dead. The scholar told the hunter that he now owed him his very life and as such he wanted to give him something—his prized parrot. The hunter and the scholar then parted. But it wasn’t long before the scholar began lamenting having given his parrot away. It was such a rare and valuable possession. He simply could not stop thinking about the parrot and wondering how it was faring with its new owner. Amma said that if Vedanta is taught to someone who is not mature enough to understand, he will only use the knowledge as to his level of understanding. “A mother gives breast milk to her baby, not meat,” Amma said. “Similarly, such knowledge should be imparted only to those who are mature enough to receive it. In today’s world, it is common to come across people who misinterpret Vedanta and—consciously or subconsciously—twist the philosophy in order to fulfill their selfish desires. Instead of acting according to the principles of the philosophy, they use the philosophy to justify their actions. As Amma often says, we should not leave Vedanta confined to the pages of books. We need to live Vedanta, letting the philosophy shine forth in all of our actions. Would a mother trick her children? Devi is the Goddess, the Divine Mother of the Universe. But in puranas, hymns and other devotional works she is also spoken of as maya, the illusory power. For example in the Lalita Sahasranama, the 716th mantra is Om mayayai namah.1 On the one hand we are presented with Devi the Divine Mother, full of love and compassion, ever ready to wipe our tears and come to the rescue of her children. And on the other, she is the symbol of maya, through which mankind is all but helplessly ensnared. Amma explained how we are able to experience this bliss in deep sleep only because during that time the mind has gone into a dormant state. In deep sleep there is no division and no sense of limitation; everything has resolved into seed form. Amma added that only when the duality imposed by the mind is transcended is one able to experience the bliss of the unlimited Self. Amma explained how when one finally transcends the limitations of the mind and realizes the inherent oneness of all creation, they will never again experience anger or hatred. They will only know peace, love and happiness. 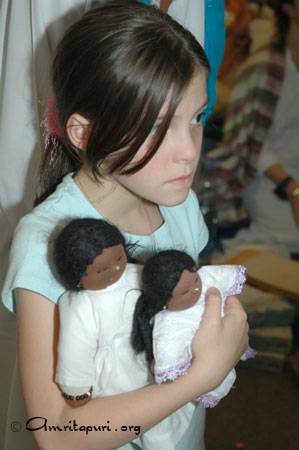 To illustrate, Amma offered the example of two children playing with dolls. Eventually the children begin to fight, each one wanting a certain doll for itself. No matter how much the parents try, they are unable to prevent the children from fighting over the dolls. But eventually the children become tired and fall asleep. When they succumb to sleep, the dolls they are holding fall from their grasp, and they sleep side-by-side without any problem. 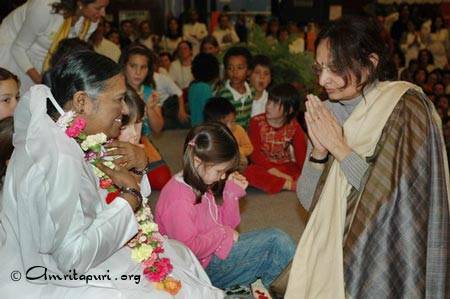 “The mind is the creator of maya and the creator of the world,” Amma said. Amma then went on to explain the panca-matas [five mothers] as indicated in the scriptures: Bhu Mata [Mother Earth], Desha Mata [Mother Land], Go Mata [Mother Cow], Deha Mata, [biological mother] and Veda Mata [Mother Knowledge]. “The Earth is the Mother,” Amma said. “So is the cow; she gives 10 times more than she takes. The tree gives 100 times more. Even if you say the body is mithya [of a transient nature], only if there is body can one realize the Self; thus, we also worship the biological mother. If you have awareness, purity of mind and intellect, the body will benefit you. Desha Mata, one’s motherland, is there also. And then Veda Mata–regardless of how much wealth you have, if you are devoid of knowledge, you will not be happy. We are dependent on all these. 3 In India, one only uses the right hand when giving gifts. 4 In the Vedantic example of the snake and the rope, a man in the semi-dark mistakes a rope on the ground for a snake. It is only because of his ignorance of the rope’s true nature, that the mind is able to project the snake concept onto it. The rope is a symbol of our true nature: the limitless, blissful and non-dual “I.” The snake symbolizes our erroneous concept of being limited and finite. The idea is that it is only due to our ignorance of our true nature that the mind is able to project its concept of being limited and finite upon us. When the professors from the United States took their seats, the first thing Amma asked them was if they were tired. Indeed, they had been on a whirlwind schedule: first to Delhi where they signed the MoU regarding the Indo-US e-Learning initiative, then to the Coimbatore campus of Amrita University where they participated in the initiative’s launch with the President of India and then to Amritapuri for an audience with Amma. After a few hours, most of them would again be on a plane ride back to their respective U.S. cities. Eleven professors out of the 20 who are participating in the e-Learning initiative made the trip to Amritapuri. They were from the Georgia Institute of Technology, the University of Illinois at Urbana-Champaign, the University of Maryland, the University of Michigan, the University of the California at San Diego, the University of North Dakota, the University of Washington, the University of Wisconsin at Madison, and Purdue University. 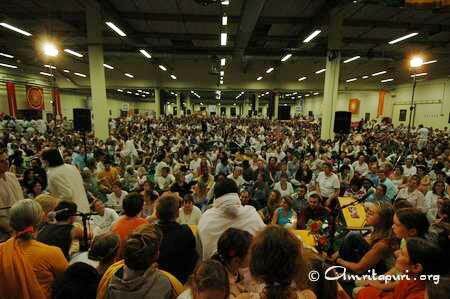 Once everyone was settled, it was Amma who began asking the questions. “What are your expectations for this project?” Amma asked. “In what way should students start developing? What are the areas in which you think we are lacking?” Amma told the professors that, as they were now familiar with higher education in both the U.S. and in India, they were in a unique position to help India fine-tune its institutions. To further illustrate, Amma told the professors about Dr. L. Ganeshan, who is currently serving at the Cancer Institute at AIMS, the Ashram’s charitable hospital in Cochin. Amma said that Dr. Ganeshan had always wanted to do research in India, but because he found that the proper research opportunities were unavailable to him here, he ended up working at Oxford. When he later discovered that AIMS provided such opportunities, he left his position at Oxford and immediately returned to his motherland. Amma said that we have to start educating our children in values from a very young age. This can be done by introducing books into our syllabi that teach them the importance of values. “Put it in a way that will interest them,” Amma said, suggesting the use of stories about people who have lived such values in their lives. Soon, it was time for the professors to depart for their flights back to the United States. But before they left, they each came for Amma’s darshan. A few even asked her to sign books of her teachings which they had received. The overall feeling was one of great enthusiasm for the e-Learning collaboration. The U.S. professors will begin lecturing from Amrita University in early 2006; their classes will be transmitted via ISRO’s EduSat satellite, creating virtual classrooms in hundreds of universities across India. For 6000 euros, could you hatch an egg? 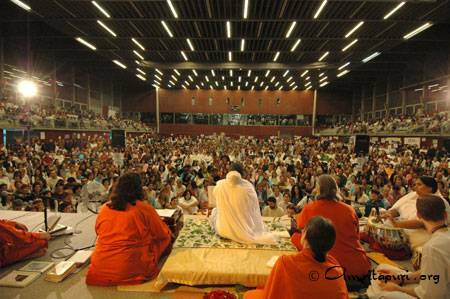 Amma was making the point that Self-realization cannot be given; it has to come from a gradual blossoming of the heart due to effort on the part of the seeker and Guru’s grace. It cannot be forced. 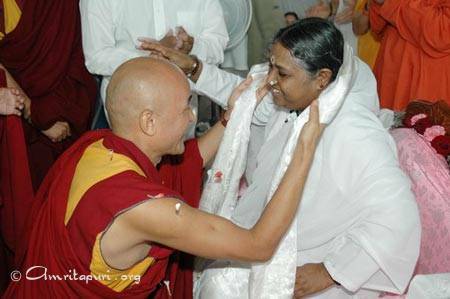 Amma went on to say that in India the tradition exists where one offers something when they meet a Mahatma or a Guru, but that it should spring forth from the reverence in their heart. 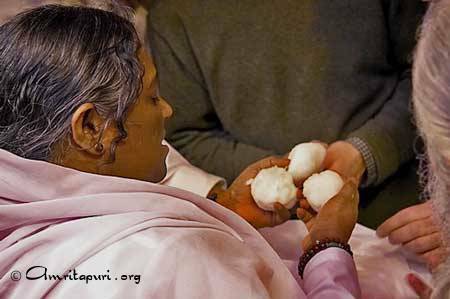 Amma then gave the example of how in the Upanishads it says that one should make offerings of samit, the special types of woods needed for fueling sacrificial fires. Samit is symbolic of our attachments and shows our desire for the Guru to help us go beyond these and become free. This was one point among many that Amma was making in order to illustrate just how necessary it is for us to understand not only the essence of spirituality, but the logic behind it, as well as the manifold facets of our tradition. People who truly understand the role meditation plays in spiritual life, the concept behind offerings, and the nature of Self-realization, can never be misled by such conman and spiritual entrepreneurs. Other traditional practices that Amma shed light upon included why we light oil lamps before the deity in temples, why we light firecrackers during festivals, the value of Prasad, and the benefits of chanting the Vedas. Amma also went into detail regarding the symbolism behind the forms of various Hindu gods, specifically God in the form of the elephant, Lord Ganesha, and God in the form of the monkey, Hanuman. 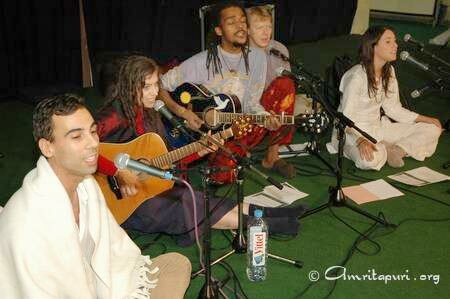 “These particular forms of worship arose out of the sankalpa of the Rishis,” Amma said. “So there is a particular meaning behind each and every one. If you understand Hanuman’s reverence for Sri Rama–his attitude of surrender, love and friendship–then you understand the principle that a person who cultivates these bhavas can become God. Also, just as a normal monkey jumps from one branch to another, our mind jumps over continents, even up into outer space. 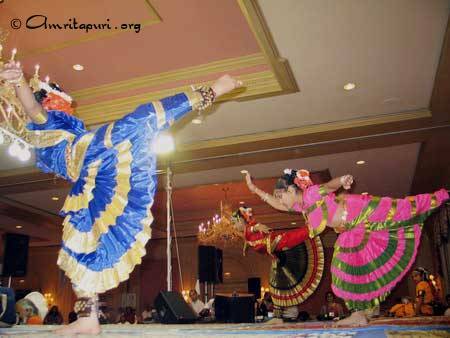 It can go from here to the moon in just one second.” Amma’s point was that, just like Hanuman, a human being who properly tames and trains his or her mind can come to realize their oneness with God. Amma explained that this is symbolic of the need of a spiritual aspirant to cultivate an intellect capable of understanding both the gross and the subtle. Amma also said that the fact that Ganesha’s ears are wide open represents sraddha [attentive awareness] and receptivity. 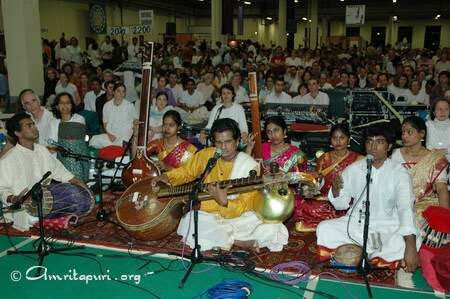 In response to such skepticism, Amma told everyone about something she had come across during her 2004 European Tour. 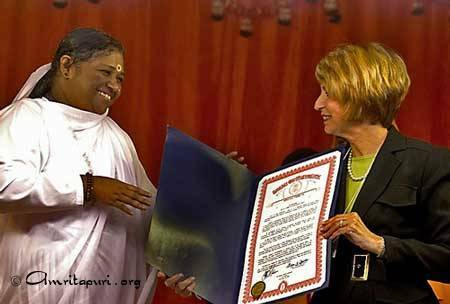 “In Ireland, Amma was at a devotee’s house, and there were all these paintings there. When I looked at them, they seemed very obscure. It looked like someone had just slapped some colours up with a broom. There were random points here and there. When I asked Lakshmi [Amma’s attendant], she explained to me that this black spot means this, and this line means that… Nobody would say that the painter is an idiot. 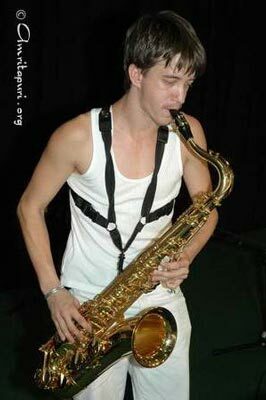 In fact, those who recognize their artistry are respected as great intellectuals. Nobody asks questions like, ‘When so many poor people are starving, how can you spend so much on these paintings?’ The pictures were worth 200,000 or half-a-million or even one million dollars. They were so expensive that they had to have security cameras and personnel there to protect them. So if you can understand the obscure symbolism behind the complicated paintings, then why can’t you understand the symbolism behind Ganesha and Hanuman? 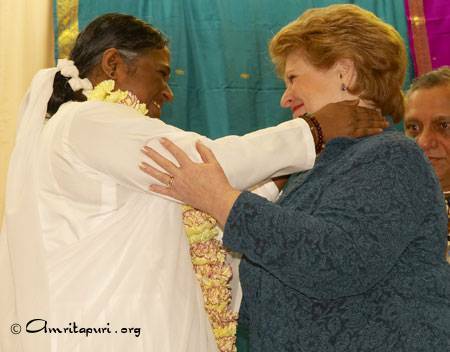 After two months of touring Europe and America, Amma was finally on her way back to Amritapuri. But as Amma’s return trip home included a one-night stop in Germany, she was able to stop at the same horse ranch in Odenwald that she had visited two months earlier . The horse ranch is owned by Amma’s devotees and has been regularly used to house Ashram retreats. The morning after her arrival, Amma emerged from her room just before dawn. The air was -5 degrees Celsius, and everything was covered with snow. Despite the weather, Amma said she wanted to see the horses, just as she had done on her previous visit to the ranch in October. The devotees then led Amma to the stables where she proceeded to visit each and every horse, offering them prasad of carrots and bread. 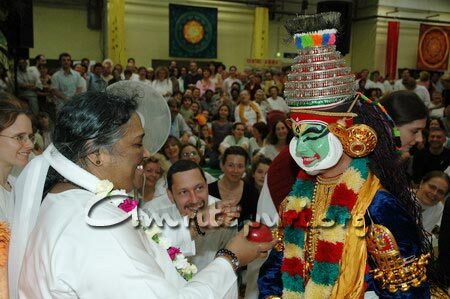 As Amma went from stable to stable, one of Amma’s devotees from France noticed that there was an empty stable up ahead. Quickly formulating his plan, he secretly went ahead and closed himself inside the stall. When Amma reached that stable, she was surprised to see not a horse but one of her human children instead. Everyone had a good laugh and Amma fed the devotee the same prasad she was giving the horses. When Amma was finished feeding all the horses, she came outside to find two white horses waiting for her in the corral. The scene was magical: the white horses walking through the white snow and Amma in her white sari moving forward to caress them. 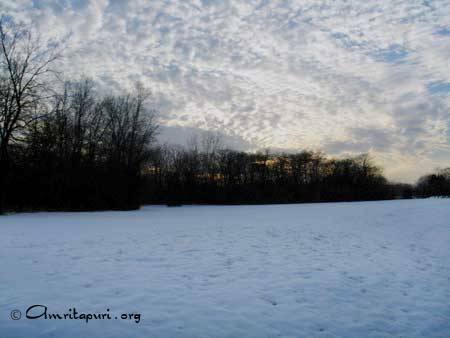 In between feeding the horses, Amma picked up handfuls of snow and playfully examined it in her hands. Just like everything else, time seemed to have frozen. But eventually the pale winter sun began to rise on the horizon. It was time to go the rest of the way back home to India.